Marsh, James H.. "Klondikers Challenge for the Stanley Cup". The Canadian Encyclopedia, 25 January 2019, Historica Canada. https://www.thecanadianencyclopedia.ca/en/article/klondikers-challenge-for-the-stanley-cup-feature. Accessed 25 April 2019. ​With our national game now a multi-billion-dollar professional sport, it is perhaps comforting to look back to simpler times when hockey was closer to community, and was played for love and glory by amateurs. In the early days of Stanley Cup competition, any Canadian team with some success at the senior level could challenge the current champs. In 1905 one of the strangest challenges came from Dawson City, Yukon. Boyle's exploits in eastern Europe make him one of Canada's unheralded adventurers (courtesy Woodstock Museum). With our national game now a multi-billion-dollar professional sport, it is perhaps comforting to look back to simpler times when hockey was closer to community, and was played for love and glory by amateurs. In the early days of Stanley Cup competition, any Canadian team with some success at the senior level could challenge the current champs. In 1905 one of the strangest challenges came from Dawson City, Yukon. In the late 1890s, Dawson had been the centre of the Klondike Gold Rush, a boom town filled with rogues and adventurers — none better known than entrepreneur Joe Boyle. The new city prided itself on keeping up with the outside world; it was mad for hockey and had a state-of-the-art covered arena. On one of his frequent trips to Ottawa, Boyle — already wealthy, and on the verge of becoming a major gold industrialist — issued a challenge to the reigning champion Ottawa Silver Seven, and it was accepted. Boyle organized an all-star team that included Weldy Young, a civil servant, "Sureshot" Kennedy, Hector Smith, Dr. D. R. McLennan, who would play rover, and J.K. Johnstone, a former Mountie and now a post office worker. 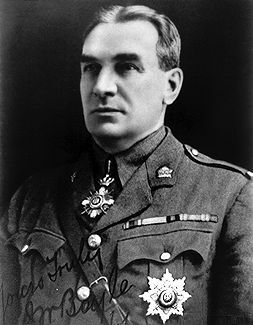 The team would pick up cover-point Lorne Hannay in Winnipeg. Québec native Albert Forrest, only 17 years old, would play goal. Boyle, who had amassed a small fortune in managing gold stakes and selling timber, put up some of the money and also found other investors. Players were expected to pay their own way, with hopes that expenses would be recouped from gate receipts. The "Nuggets," as Boyle dubbed them, set out from Dawson on Sunday, 18 December 1904. Since lack of snow made the dogsleds useless, and after the bicycles all broke down, the men resigned themselves to a long walk (some 530 km) to Whitehorse. There they planned to board the White Pass & Yukon Railway for Skagway but a blizzard blocked the pass for three days and the men arrived two hours after the steamer left for Vancouver. "Hanging out in Skagway," wrote a later observer, "did nothing for the team conditioning.” Another said, “They were in serious liver training." The next ship battled heavy seas and was diverted to Seattle by fog, so by the time the team doubled back to Vancouver they were five days behind schedule. 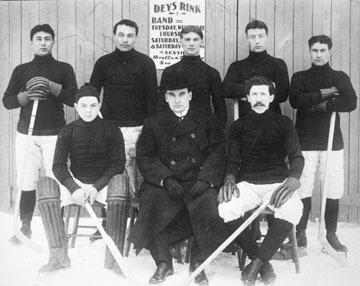 The weary Nuggets arrived in Ottawa on 11 January 1905, just two days before the first game. Boyle had tried to get a delay before the start of the series, but this wasn’t granted. The team checked into a local hotel and then made for a sporting goods store to buy uniforms and equipment. Despite the exhausting trip the Nuggets were confident. Still, the Ottawa team included several outstanding athletes. Among those, defenceman Harvey Pulford had been light-heavyweight and heavyweight boxing champ of Eastern Canada and later rowed in the English Henley Regatta. Rover Harry “Rat” Westwick (a Hall of Famer), excelled in many sports growing up and had been a lacrosse champion. But Frank McGee stood out. Even Wayne Gretzky's playoff records pale in comparison. In 22 Stanley Cup games he scored 63 goals! The second game in this best of three proved another old hockey axiom. Hearing that the Nuggets sneered at his single goal in the first game, Frank McGee lit a fire, scoring 14 goals in a 23–2 romp, a record that will never fall. While Boyle had earlier sent back overly optimistic reports to Dawson, he blamed the loss on his club being worn down. The eastern press was ruthless. The Toronto Telegram said that “never has such a consignment of hockey junk come over the metals of the C.P.R.” "Dawson never had the chance of a bun in the hands of a hungry small boy," mocked the Ottawa Citizen. The Ottawa Silver Seven celebrated their victory by inviting the losers to a banquet. 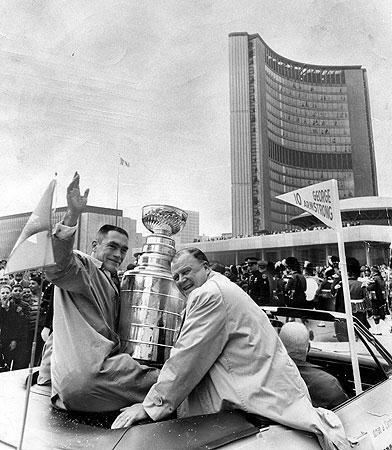 Later they took the precious prize cup and drop kicked it into the Rideau Canal, which fortunately was frozen. (The Cup was retrieved the next day.) The tour was not a complete washout for the Dawson boys. They went on an exhibition tour through the Maritimes, eastern Canada and Manitoba, winning some games and pretty well recouping their travel expenses. After this strange episode, the Stanley Cup trustees tightened up the rules to ensure better competition. D’Arcy Jenish, The Stanley Cup: A Hundred Years of Hockey at Its Best (1992). Eric Zweig, Stanley Cup: 120 Years of Hockey Supremacy (2012). Michael McKinley, Hockey: A People's History (2009).